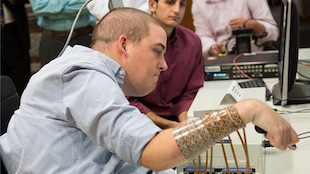 Study participant Ian Burkhart wearing the electrode sleeveOHIO STATE UNIVERSITY WEXNER MEDICAL CENTER, BATELLEFor the first time, a man was able to regain control of his hand, thanks to a neuroprosthetic device that acts as a “neural bypass” between his brain and arm muscles. Using the device, the paralyzed man was able to perform daily activities such as picking up a glass, pouring liquid, and stirring it, according to a study published today (April 13) in Nature. “This study marks the first time that a person living with paralysis has regained [natural] movement by using signals recorded from within the brain,” study coauthor Chad Bouton of the Feinstein Institute for Medical Research in Manhasset, New York, said during a press conference yesterday. Twenty-four-year-old Ian Burkhart suffered a spinal cord injury in a diving accident four years ago that left him paralyzed from his shoulders down. Doctors implanted an electrode array in Burkhart’s brain in the part of his motor cortex that controls hand movements. 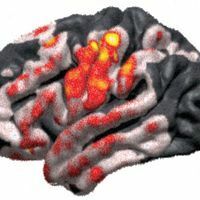 Bouton and colleagues used machine-learning algorithms to decode Burkhart’s brain activity and use it to stimulate a sleeve of 130 electrodes worn on his forearm. Burkhart trained with the device up to three times a week for more than a year, and was eventually able to move individual fingers, allowing him to execute precise movements such as swiping a credit card or playing a guitar video game. “The first time I was able to open and close my hand [again], it kind of gave me that sense of hope,” Burkhart said during the press conference. “If, or when, I can use this system outside a clinical setting, it will really increase my quality of life and independence,” Burkhart added. 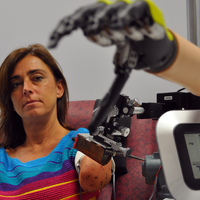 The achievement builds on previous work at labs around the world, which have demonstrated brain control of computers, robotic arms, and even full-body exoskeletons. It may be years before the technology sees widespread clinical use, however. 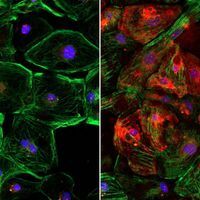 During the press conference, study coauthor Nick Annetta of Battelle Memorial Institute in Columbus, Ohio, pointed to other potential applications for this technology, such as treatments for patients who have suffered a stroke or traumatic brain injury. “We think this is just the beginning,” Annetta said.